Early in December, I made a trip to element14 to treat myself to an early Christmas present. Having posted about it on my element14 blog, inviting members to take a guess at what the surprise would be, I was surprised that there was only concern … maybe it’s not what it seemed? 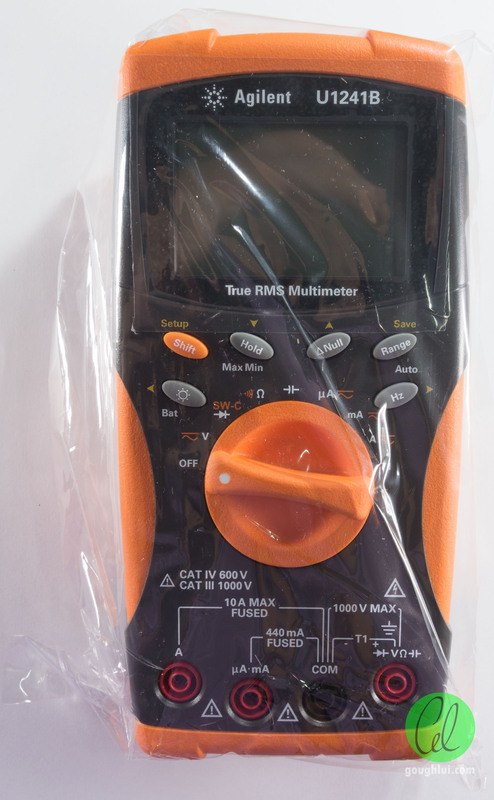 Well, since my post about the accuracy limitations of 3.5 digit multimeters, I figured that I would appreciate something with a more solid guarantee of accuracy. Scouring element14’s catalogue led me to settle on either getting a Fluke (i.e. the “industry standard”) or an Agilent Technologies (now, Keysight Technologies) multimeter. What finally swayed me to the Agilent solution was the improved accuracy (0.09% +/- 5 digits) over that of the competition and the wealth of accessories available with the Agilent in regards to computer connectivity which is so important to someone who does a lot of experiments requiring data logging. All of this was at a not-unreasonable price-point, from a major test equipment vendor making it seem like a sound investment. Despite the loss of the student advantage discount, I decided to still go ahead and splurge on myself. I reasoned that having a good handheld meter is a tool I will use a lot into the future, and I would only need a limited number of those. Besides, the U1241B was on special in the Connect magazine, so I’m probably saving a little as well. Of course, it wouldn’t really be treating one-self if I just bought the core unit and left it there. Many people might try, but it’s often a case of staring at the accessories catalogue, promising yourself that you’ll buy it “someday” in the future, and then eventually wishing you’d bought it sooner when you realize that the accessories have been discontinued for a new line of incompatible accessories designed for a newer line of products. There is some redundancy in this order – as I came to realize later on upon unboxing. 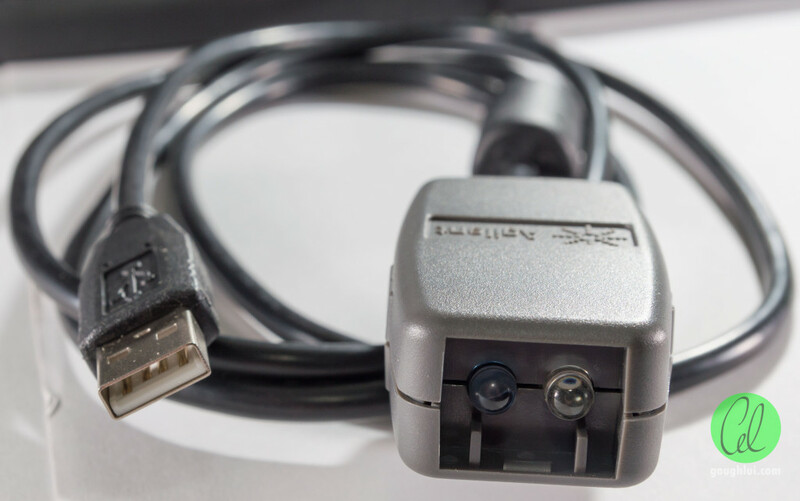 Through the accessories, it unlocks the meters’ ability to interface with a PC through USB, as well as to phones/tablets and PCs wirelessly through Bluetooth, as well as perform temperature measurements. 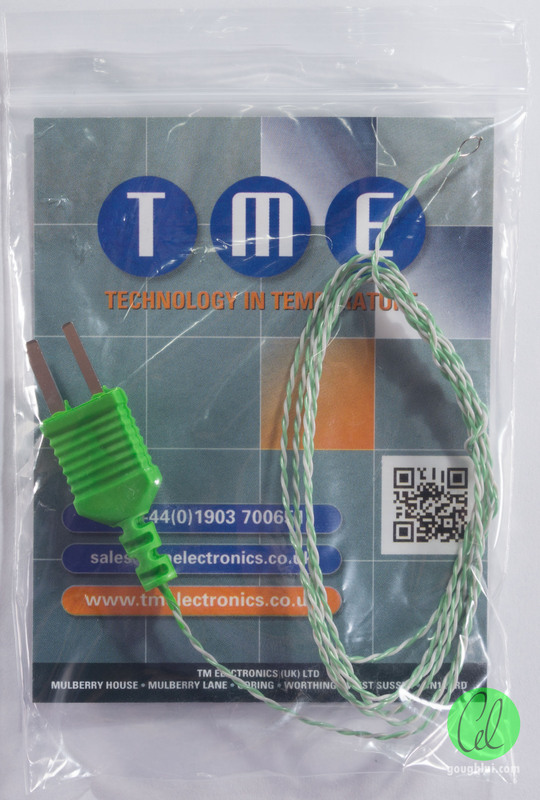 I made a choice to purchase a third-party K-type thermocouple as it was cheaper and generally a standardized item. Finally, although a bit on the pricey side, I also opted for an Agilent carry case to “protect my investment” and add that finishing touch. Lets take a look at all those shiny boxes and what’s included inside. I’ll take the time to call out a few features which are distinctly different from the lesser meters. 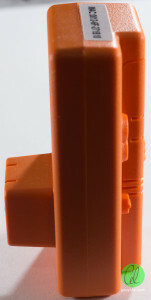 The unit comes packed in a sturdy, orange, colour cardboard carton. 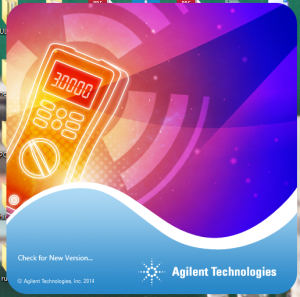 Despite being branded Agilent (which I like more), it’ll probably soon change to the red Keysight-colour branding scheme. 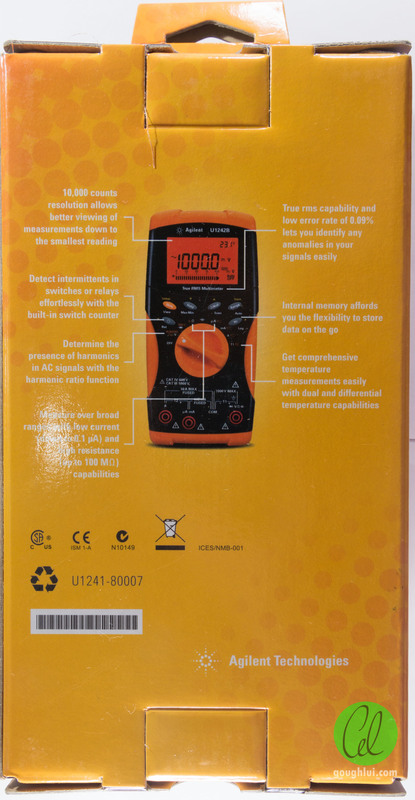 Of course, the box shows off the meter, and some of its key features – 4-digits, 0.09% basic accuracy, CAT III 1000V and CAT IV 600V safety ratings. Needless to say, the safety aspects of this meter aren’t just lip-service as they are in the low-cost meters. One thing you would have noticed on the box is the Bluetooth message at the top saying “Go Wireless Today”. 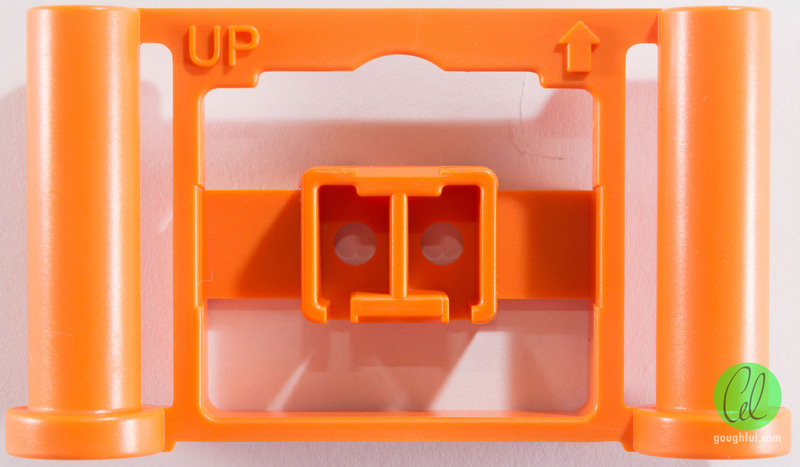 Despite the packing lists generally saying the adapter bracket (U1179A) is not included, it seems that boxes with that particular marking actually have the adapter bracket included. 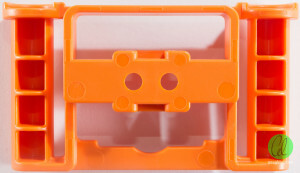 As a result, I ended up with two adapter brackets, having ordered one separately. It’s no surprise the unit itself is in the box. 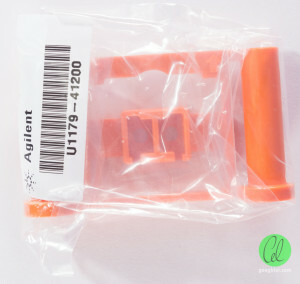 The chunky and handsome unit is protected by a few bits of plastic, and features orange rubber trim, as is the Agilent norm. The unit features four inputs along the bottom, and mostly looks like a regular multimeter. It looks very nice and clean with the plastic taken off. The rear features a “split” stand which allows for sitting at different tilt levels on the desk. It also houses a place for you to store your sharp test probes (so they don’t hurt anything). 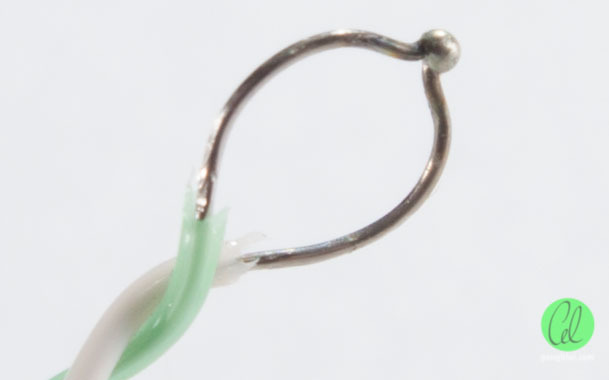 In between the test probe holders are the infrared LEDs for data communication – the bracket is necessary as there is nothing to plug the infrared transceiver to. At this point, you might be thinking the whole infrared thing is overblown – why not just use regular IrDA instead of a specialized protocol, or why not just use regular USB. In fact, it seems like there are several safety and design choices made. 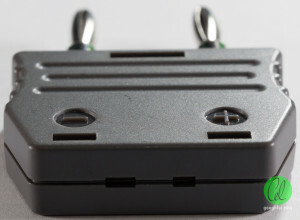 The use of infrared provides an optically isolated connection which avoids any harm to your connected equipment in case of insulation break-down in the meter, thus keeping your PC safe! 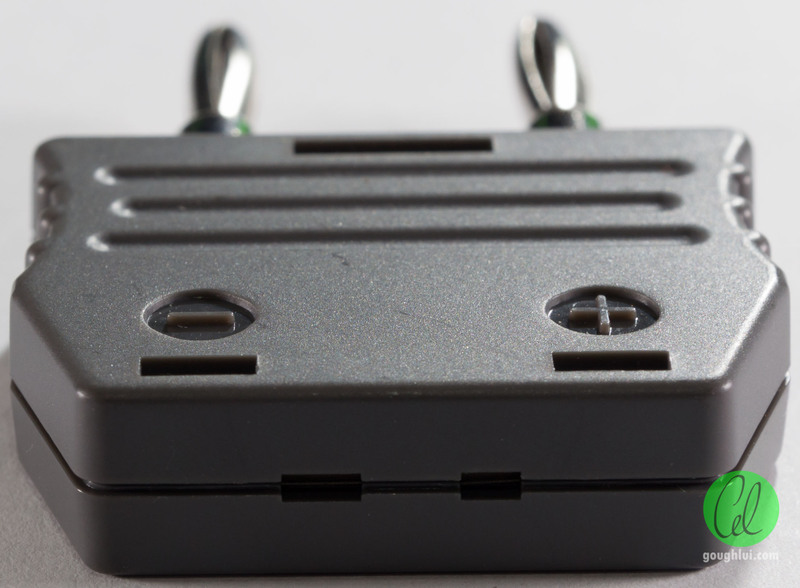 The use of a basic IR connection also comes down to reducing cost, battery consumption of the link and improving the battery life of the meter. Another safety related result is the “closed case” nature of the meter. The full casing should not need to be opened except for replacement of the safety fuse. A separate battery door is provided to fit the batteries. 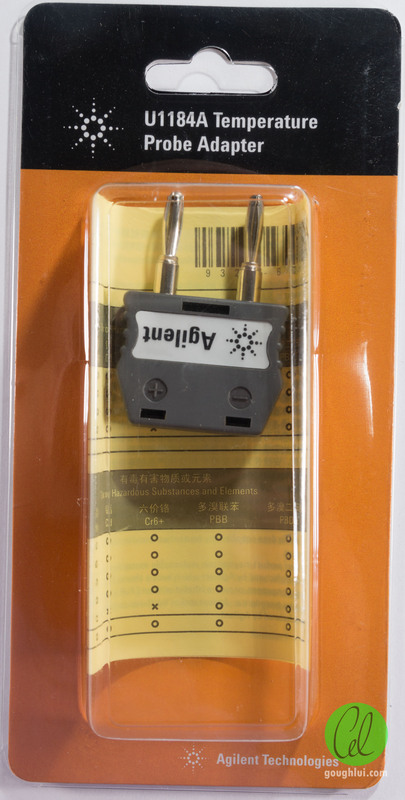 The fuse itself is adequately rated at 1000V to ensure category compliance at the rated voltage, which is something many cheap meters fail to do. Speaking of batteries, this unit eschews the nasty 9v batteries used in virtually every cheap meter for a set of four AAA’s. While this isn’t exactly my first choice (AA’s have much more capacity), it’s still a sensible choice. 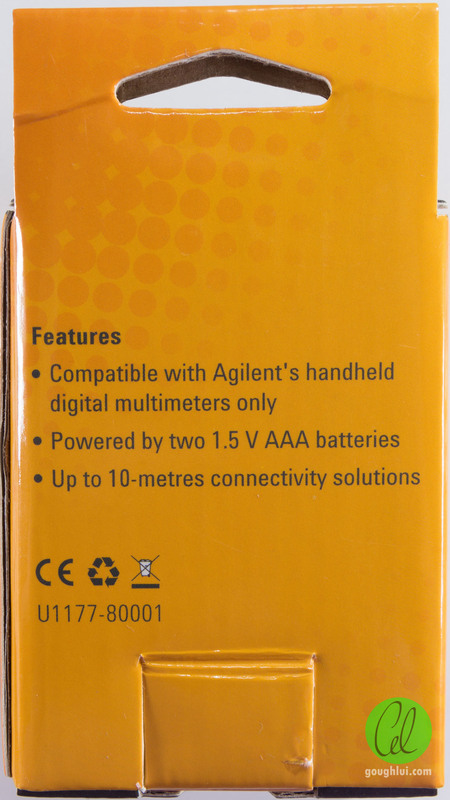 It’s interesting to note that Agilent’s more advanced meters even feature rechargeable batteries that can be charged through the front banana plugs which is pretty cool! 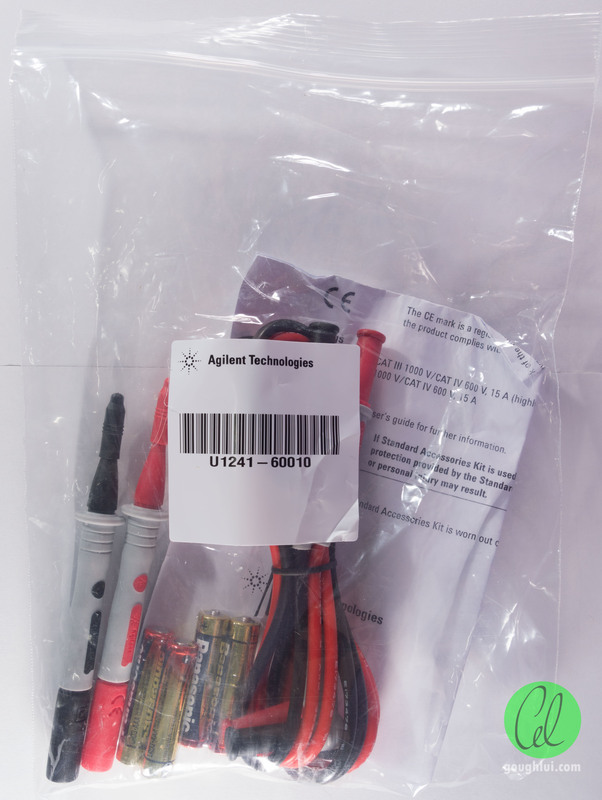 Also included in the box is a packet containing the test leads, probes and covers, and even batteries. Lovely. We can see the probes themselves have a nice and fine tip, along with shrouds that cover almost all the way to the tip as a safety feature. This allows the probes to have a matching safety rating of CAT III 1000V and CAT IV 600V of 15A. Even the probe wires are made of high quality “silicone” wire with 150 degrees C resistance (to avoid burnt insulation) and 6kVDC insulation rating. 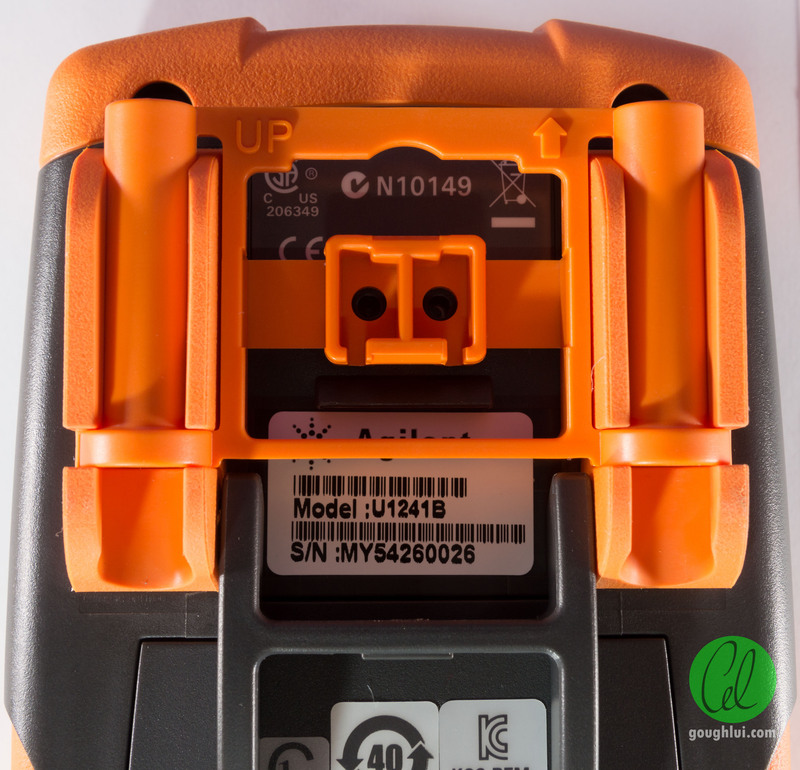 This is but one of the differences between cheaper meters and their reputable brethren – the inclusion of properly rated accessories. 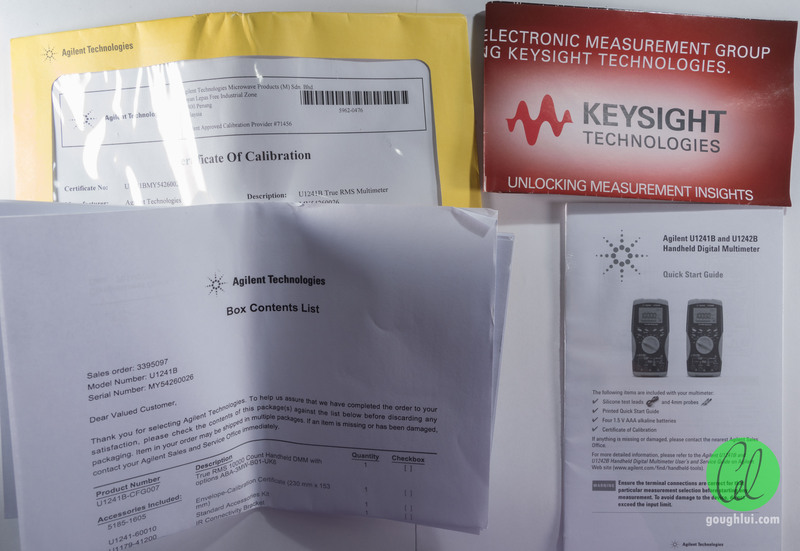 Of course, it wouldn’t be complete without a quick start guide, a Keysight brochure, and the all important Certificate of Calibration which is your assurance of accuracy (for the first year). In order of “coolness”, this has to be number two in the list of stuff. As mentioned earlier, the bracket for the multimeter (U1179A) wasn’t expected to be included with the multimeter, and is not included with the IR to Bluetooth adapter, so normally has to be purchased separately. 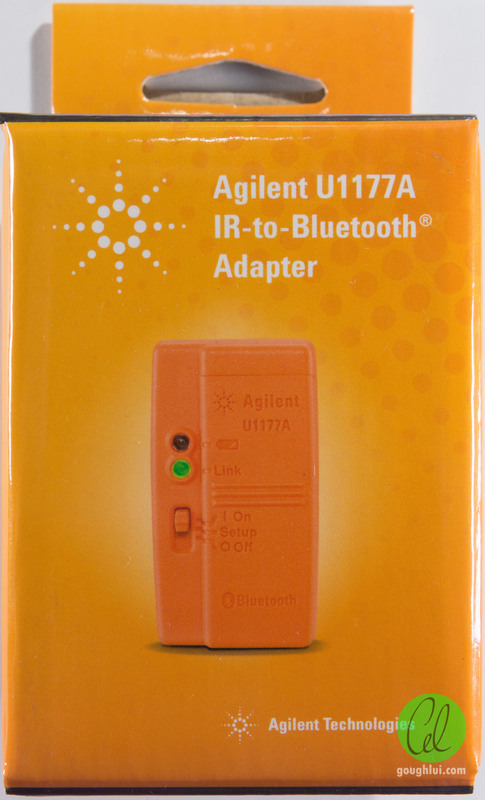 This unit is a chunky infrared to Bluetooth adapter designed to work with Agilent’s handheld DMMs through the adapter bracket. This unit comes in two varieties – the U1177A above, which is a “short range” 10m adapter, and a “plug in replacement” U1117A which is a “long range” 100m adapter. Since the long-range adapter costs a little more and wasn’t in stock, I opted for the shorter range unit. 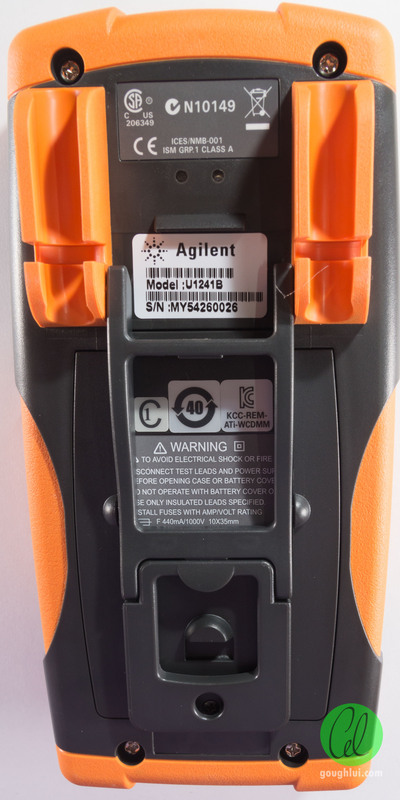 Having Bluetooth wireless connectivity is a nice idea, since it allows for remote meter placement and could improve safety by reducing the need to stand next to hazardous equipment where some RF can be tolerated. 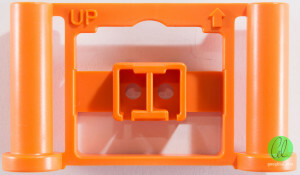 The unit itself is noticeably orange and “clips” into the adapter bracket. It is configured by a sliding the switch to Setup, connecting to it, and issuing a sequence of AT commands (fully documented in the manual). This allows for customization of name, and PIN code to stop others from screwing with your link. To operate, slide to On and connect with the configured parameters. The IR LED/Phototransistor is visible out of the rear of the unit. 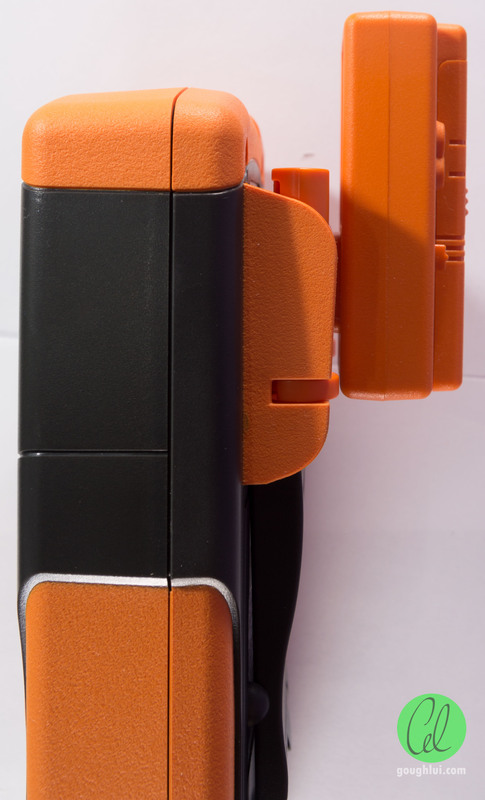 The unit itself generally lasts about 20-30 hours on its batteries. The unit itself is powered by two AAA batteries (which I suppose, is nice, given that its the same as the sort used by the meter). 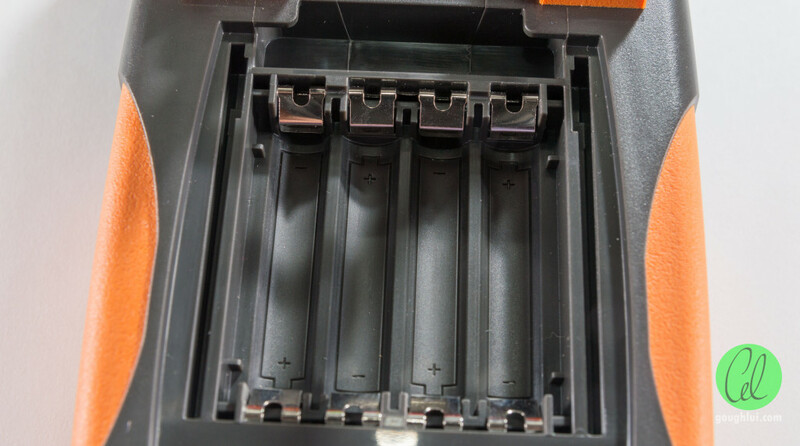 There is a set of test-points visible in the battery door, which might be used for testing or reprogramming misconfigured units. It comes with a short form manual and batteries (although the ones provided actually already expired a month ago – so it was probably old-stock). To put it on, you need the adapter bracket. Taking the adapter bracket, and orienting it as marked, you need to clip it on the rear of the meter where the probe holders are. 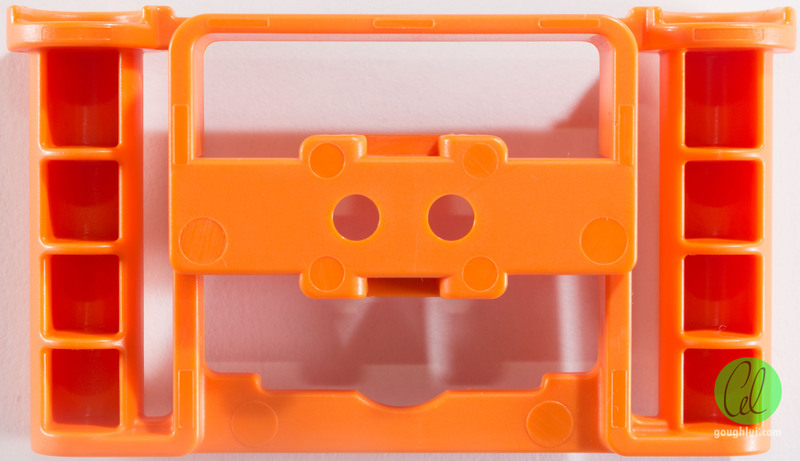 Then you can clip the adapter onto the bracket. This makes the meter a little top heavy, but it does stand happily on the stand. To remove, you just reverse the instructions. This particular cable is actually considered discontinued now. At the time of purchase, it was still available and slightly cheaper, so I went for it. This one has been replaced by the U1173B, which only really changes the colour to that bright orange. Functionally, the cables seem to be identical. Seeing as I have Bluetooth, why would I also opt for a USB cable? Well, anything wireless is susceptible to jamming, interference and drop-outs – and the Bluetooth adapter chews batteries too, so why not opt for something a little more traditional and reliable? The cable itself is made from a nice and thick USB cable, with a decent length. Like the Bluetooth adapter, the LED and phototransistors are visible at the end. 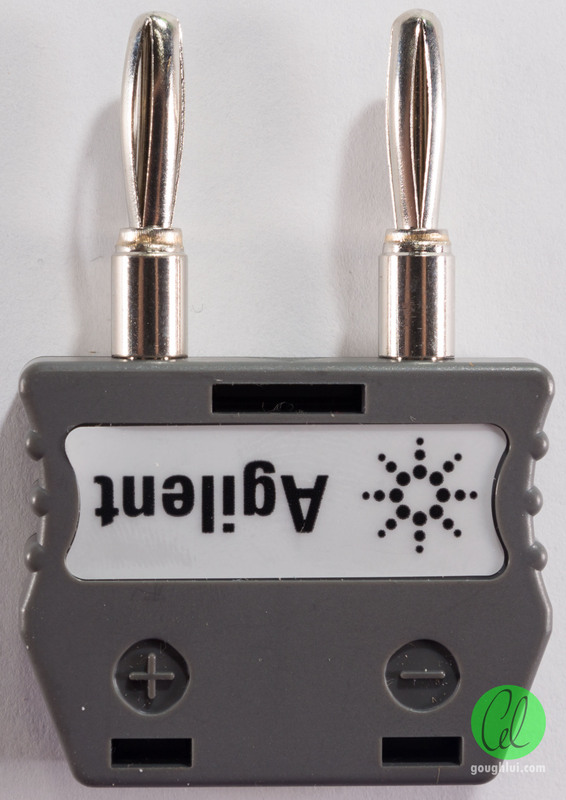 One particular gripe I have is that despite adopting IR for connectivity, the IR used in their LCR meter uses LEDs with a different spacing, and thus no amount of adapter bracket-ing will fix that. It just seems a little bit like accessories price-gouging to me. Anyway, the cable itself using Prolific PL2303 drivers, which I already had handy on my system – but a quick teardown of the cable confirms its basic IR status. It seems as if it’s taking the serial bitstream at baseband and turning the LED on and off in synchronism with no subcarrier at all (hence the need to exclude stray light). This kind of adapter is necessary if you wish to use the temperature measurement ability of the multimeter. In addition, you need a temperature measurement device as well, and a K-type thermocouple is pretty much the “standard” (although, hardly most accurate). 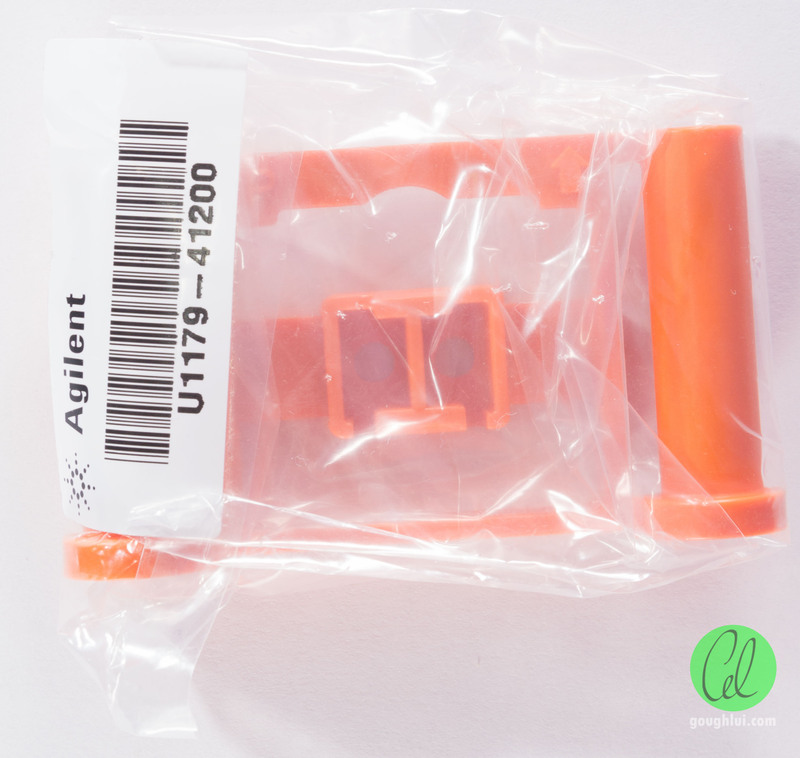 Eschewing Agilent’s line of products allowed me to save quite a bit of money here. Now, we come down to the absolutely technically boring part of the unboxing. 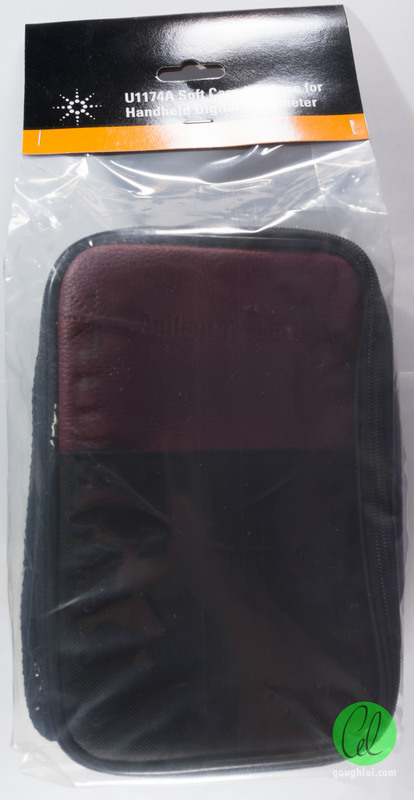 A soft carry case isn’t exactly anything thrilling – save for the maroon stripe of pleather across the front with the Agilent Technologies logo. If it didn’t have that, we wouldn’t buy it! 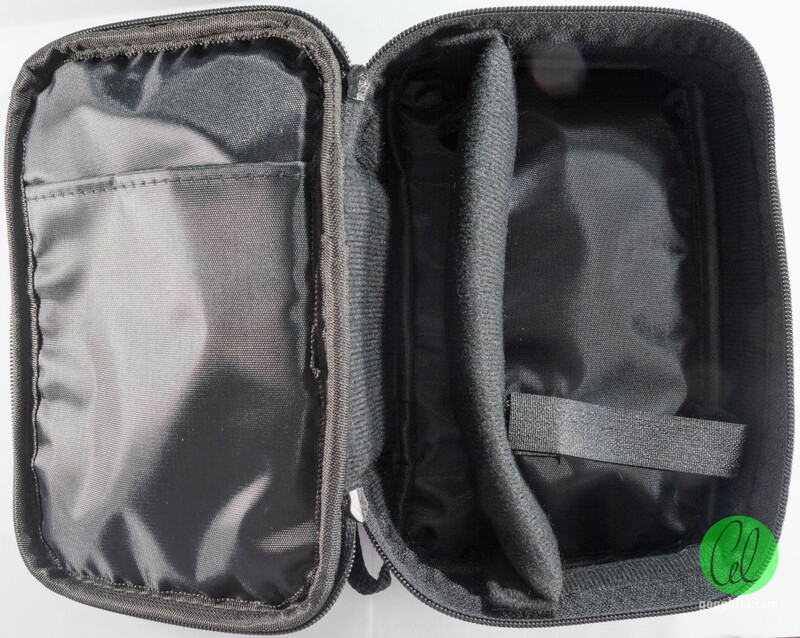 Anyway, the case itself seems to have some thought put into the storage divider configuration, but isn’t “bespoke” as it is specified as an optional accessory for a wide variety of Agilent handheld devices. With some care, it’s possible to squeeze in all of the nice goodies into the case (using the front pocket as well) … safe and sound for transportation. In using the unit, I have to say, it’s generally quite a likeable unit which is easy to use provided you first configure the unit by holding down Shift during power-up, which allows things such as beeper tone, default AC/DC measurements, etc to be changed. Some of the defaults really don’t suit all (e.g. I prefer DC default, beeper off, for example). 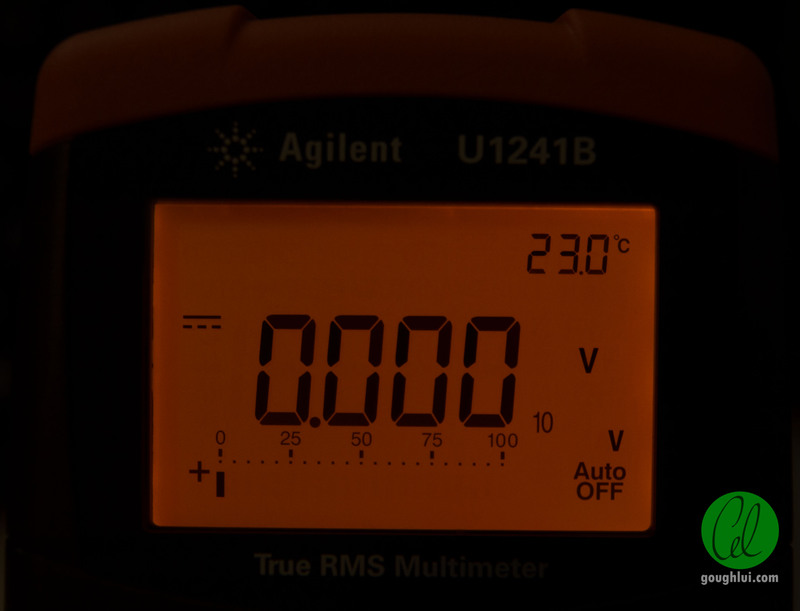 The unit is switched on with a rotary switch, like most multimeters, which results in a short test sequence including display test. Most positions featuring two features which can be toggled through the Shift push button. Further push buttons allow for other features and manual ranging. 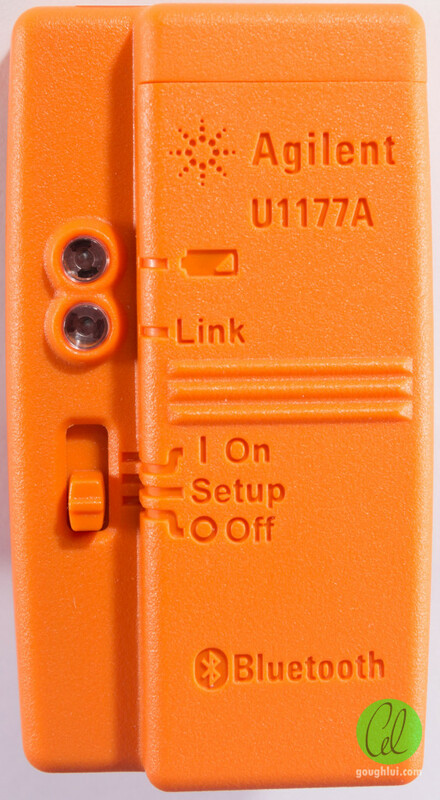 The inputs themselves have jack-sensing, which will alert you to incorrect connections for a given range, improving safety. When making measurements, auto-ranging is generally very responsive, and measurement readouts are provided at 4-digit/10,000 count resolution at a rate of about 7 readings per second which is much faster than the cheap handheld meters. The bargraph is also updated very quickly which gives you a “pictorial” representation of the reading. The U1241B is a “lesser” sibling to the U1242B, and thus omits some of the additional features such as on-board reading logs, harmonic ratio, temperature differential readings amongst others. Unfortunately, this isn’t made as clearly as possible on the packaging, so maybe for a small price differential, it would make sense for some to buy the U1242B instead. That being said, some users seem to have found a way to upgrade their U1241B meters. Maybe that’s something for when I have some time and willingness to violate an otherwise perfectly good meter. The meter itself also has an internal temperature sensor which allows you to log the temperature at the time of the measurement. 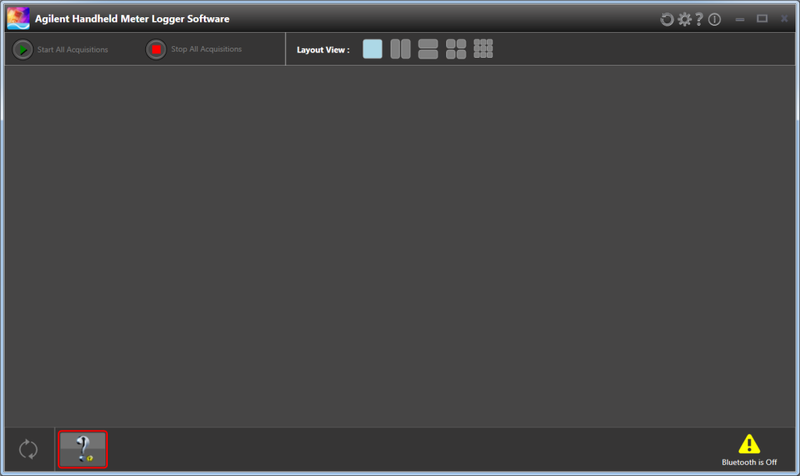 Unfortunately, aside from displaying in the corner, it doesn’t seem to be able to be logged. The build quality seems adequately solid, with no creaking upon putting stress on the casing. 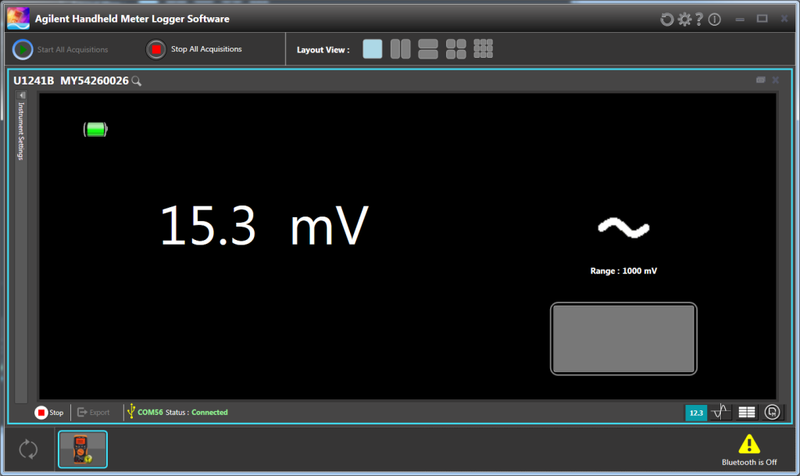 I wouldn’t want to throw it around though, so it’s probably not at the same level as the Fluke meters. For a benchtop/indoor use situation it’s more than adequate. In terms of accuracy, I didn’t have the time (or sufficiently sophisticated equipment) to properly gauge its accuracy. However, doing some spot-checks with my Keithley 5.5 digit seemed to have all readings “coinciding” with their range of error, thus giving me confidence that the meter itself does at least try to live up to its accuracy specs. The main star of the connectivity bundle is the Agilent Handheld Meter Logger Software for PC. 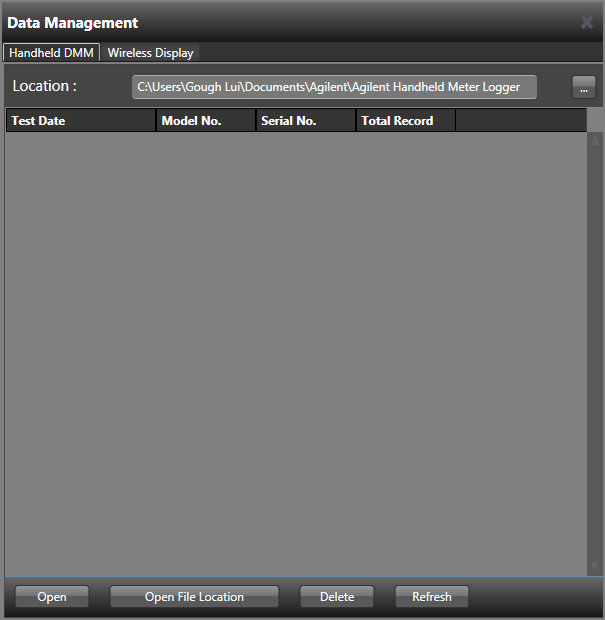 The software is a 141Mb download, free of charge, and provides both remote meter display and advanced logging capabilities. 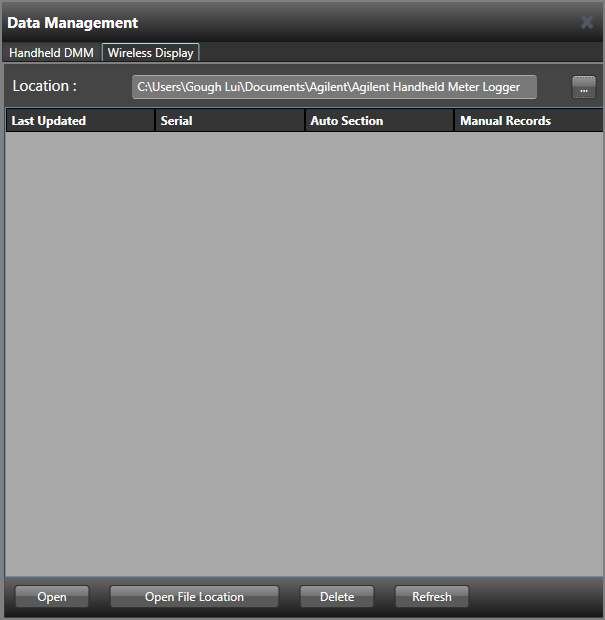 The software initializes to a large view, which can be split into different views for when multiple devices are connected. 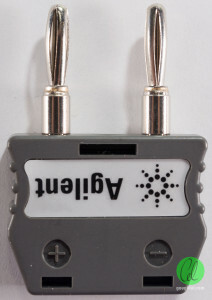 It will automatically search for connected meters – USB or Bluetooth. 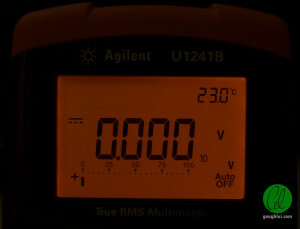 When an appropriate meter is connected, it is possible to perform certain actions with it. 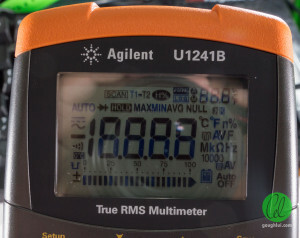 For example, basic remote display of the multimeter is possible, although refresh rates of the readings are inferior to that of the screen on the meter, averaging about one or two per second compared to seven per second on the screen. This is likely due to the 9600bps link rate and processing speed of the meter itself although I did not verify this. 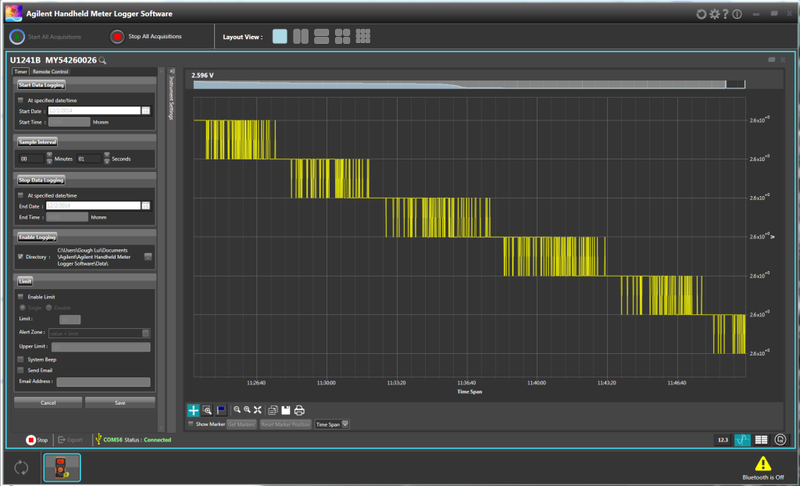 Beginning the acquisition to show the remote meter also begins data logging by default, where every reading is recorded into a database for future export. 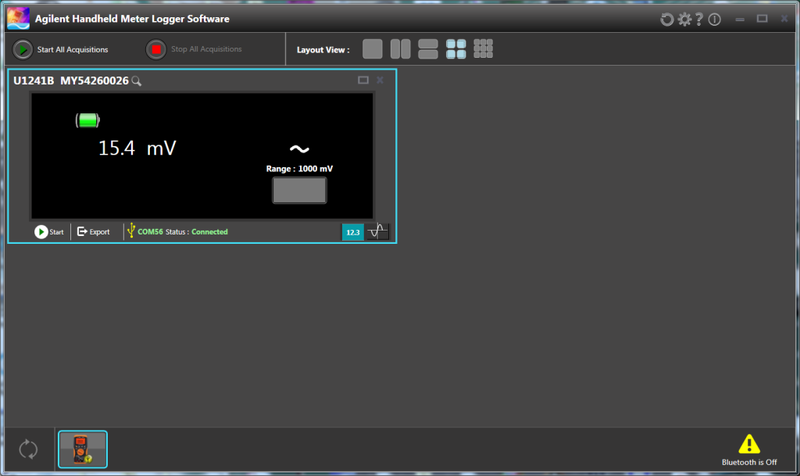 The recording interval can be configured to your liking although does not go below 1 second. 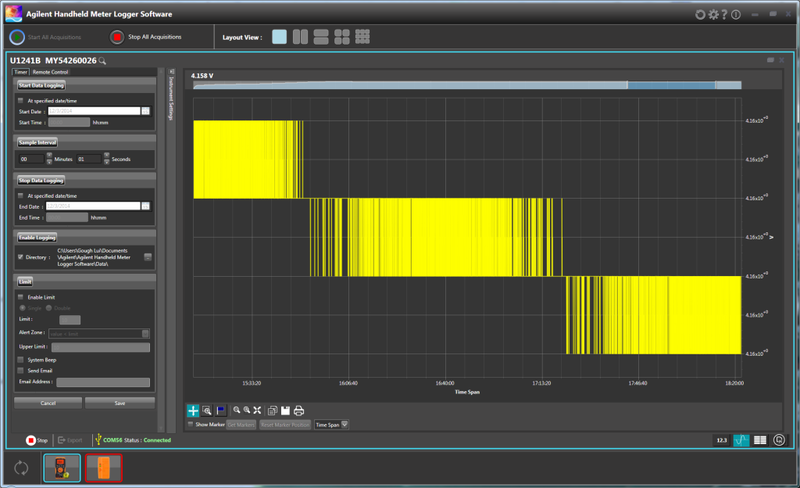 The system can also be used to ensure signals stay within limits, with numerous alert features available (provided you have configured them correctly in the settings). 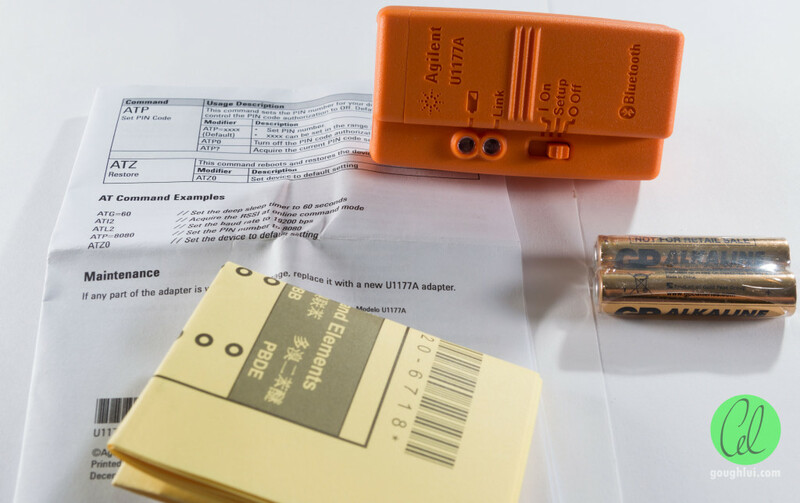 Despite there being a remote control tab, only a limited number of options are available – namely the switch from AC to DC metering and fixing of manual range. 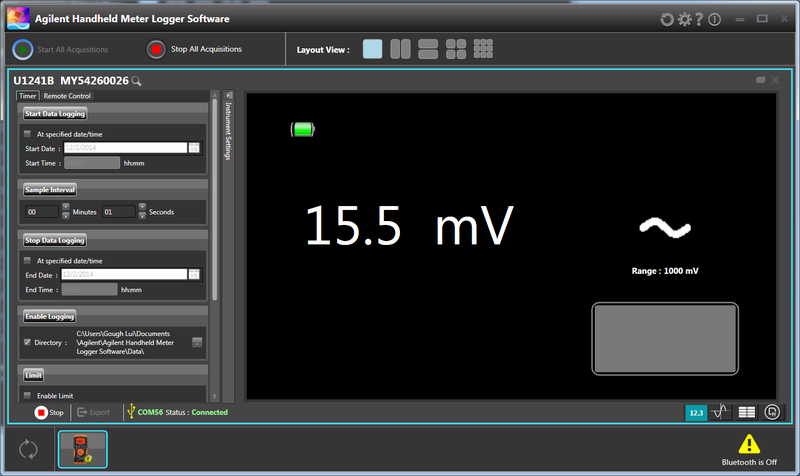 The measurement position of the switch needs to be physically changed at the meter, and cannot be done by software. 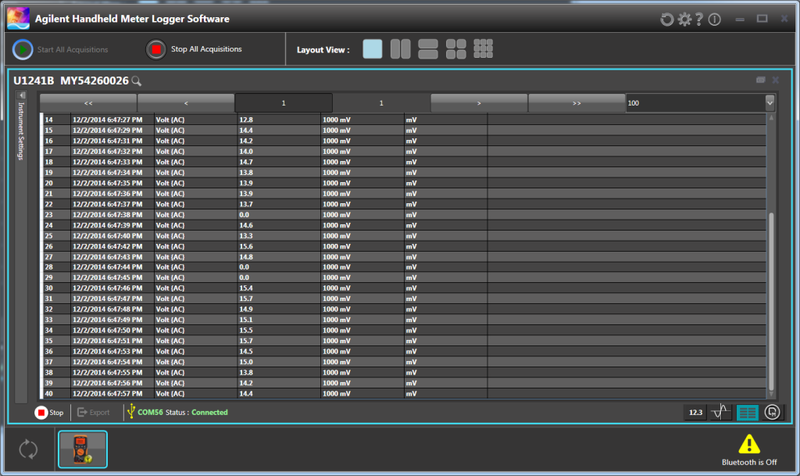 If you had multiple units, they can be displayed in a multiple view as follows. Of course, viewing the units as just numbers might not be most illustrative, so the views can be toggled to a live histogram which can be scrolled/zoomed to your liking. A table of raw values is also available for those who like it. Additional features include the ability to download manual or automatic logged data from a supported multimeter’s internal memory, and save/export any logged data using the application itself. Data is exported as an Excel worksheet. 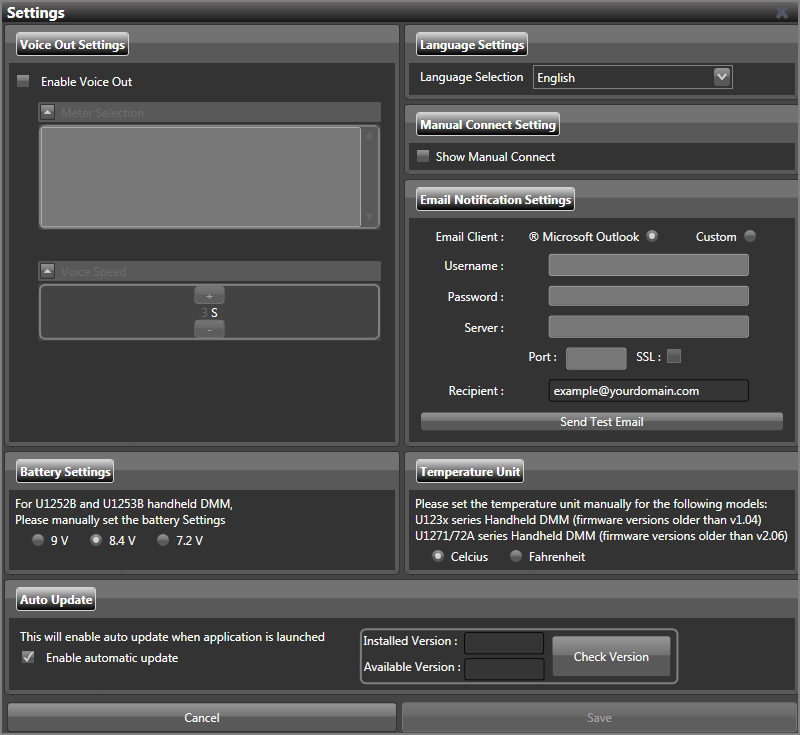 Other configuration settings necessary with the software include the settings dialogue if you wish to use e-mail alert functionality. Voice-out (i.e. reading meter values by text to speech) is also enabled in this screen, at a minimum interval of one reading every 3 seconds. Suffice it to say, I know how to stress out a piece of logging software. My first test is to see how it handled logging the AC line voltage over a period of 3 days plus. The software itself handled it without any major issues which was good to see. In that time, a storm passed, and a short dip in line voltage was recorded. 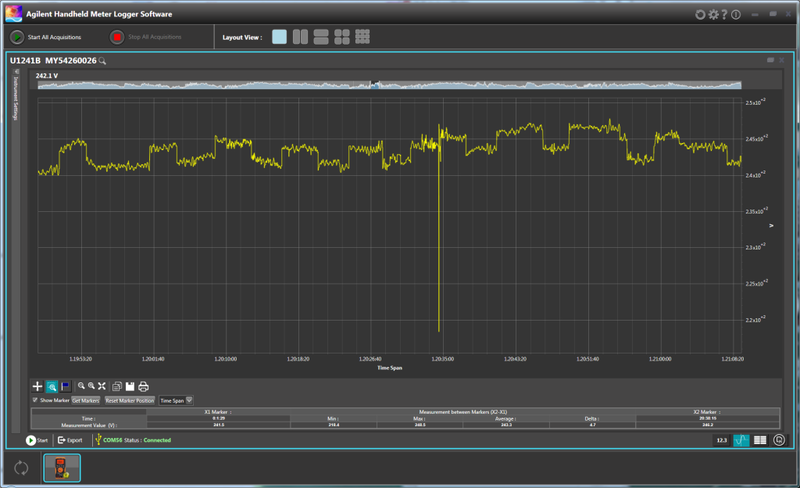 It was possible to zoom into it during and after the acquisition which was nice. In zooming in, we can see a “humpy” pattern which seems to be probably due to the local padmount transformer’s tap-changing “voltage regulation” action. I also decided to use it to monitor the voltage across a Li-Ion cell during discharge with an LED flashlight. 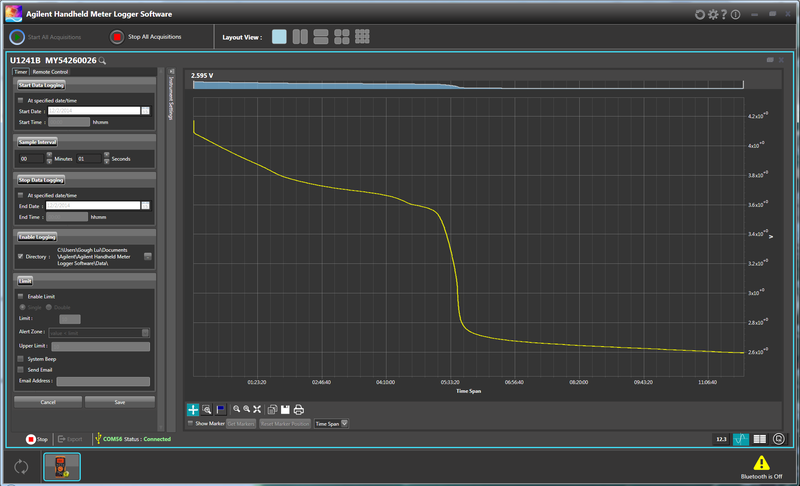 This produced an interesting curve which suggests that the torch does not have a low voltage disconnect and had instead relied on the reduction in current draw as a function of voltage to prevent cell damage in most sensible cases. … and zooming in even further allows us to see just how every digit of resolution counts. The fact the “stair” pattern follows an almost pulse-width-modulated pattern tells me that each digit is real and the flickering is not just “random noise”. For fun, I took the load off the Li-Ion cell and let the meter record the voltage “recovery” profile as the cell’s voltage began to rise again. 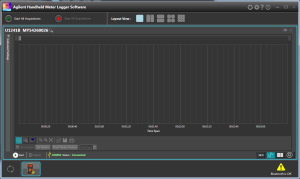 On the whole, the software seems to be quite good and operates very satisfactorily even over long logging periods. However, there are a few issues – one of my dataset acquisitions was entirely lost when power was lost to the PC during recording. There seems to be no mechanism for recovery of such data, which is a bit of a shame, or even periodic dumping of the data. 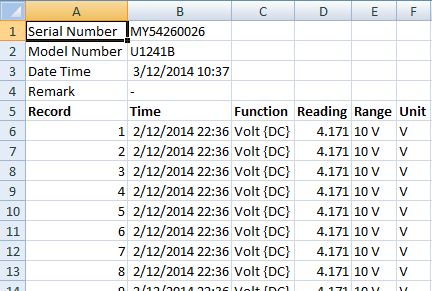 Secondly, I lost data again when the Bluetooth adapter ran out of batteries during a log of the room temperature. When the batteries run out, the software gets stuck in a reconnection loop, which prevents you from stopping the capture. The only way out is to terminate the software, which causes the current recording to be entirely lost as I painfully found out. 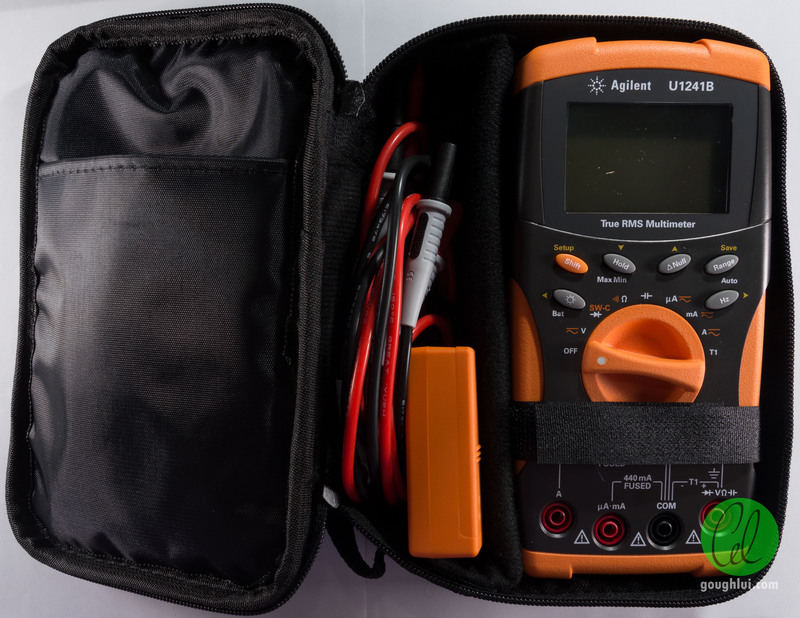 As a result, the whole multimeter solution is really only suitable for short term logging (~20 hours) due to the issue with batteries in the meter and Bluetooth adapter, and is best performed using the USB cable. Another set of noteworthy applications provided by Agilent to make use of the Bluetooth connection is Agilent Mobile Logger and Agilent Mobile Meter available for iOS and Android. 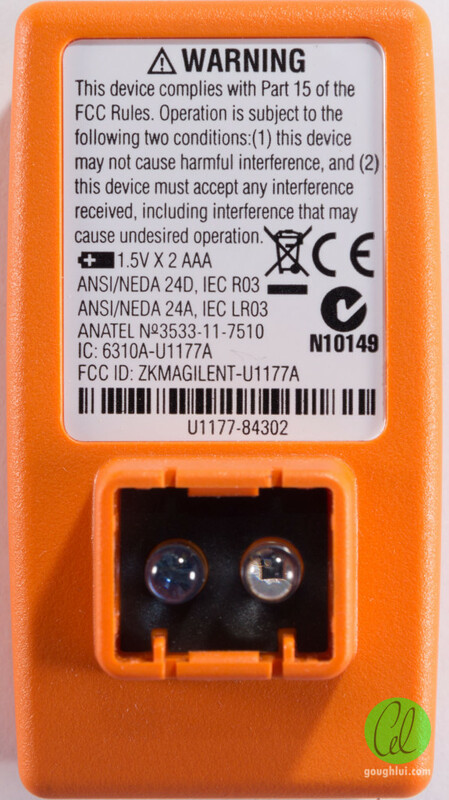 These applications allow you to do remote data logging and graphing, as well as use a phone or tablet as a remote display for up to three multimeters (two on some phones), which can make monitoring dangerous locations safer, and monitoring remote locations easier provided they’re within Bluetooth range. Unfortunately, the license conditions for these applications are quite restrictive and contain clauses which seem to exclude them from being reviewed or used for evaluation purposes. However, I must say, that while testing them on Android, they lacked compatibility with the latest (4.4 or greater) versions of Android which resulted in broken logging and graphing. Remote meter display did work, but with limited refresh rate of about 1/s as with the logging software on the desktop. 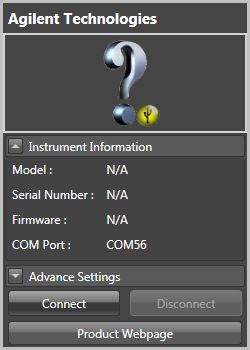 Apparently there are also features for remote server where another machine on the network can view the results from the meter as well, but I didn’t try it. Of course, the mode adventurous people would be less inclined to rely on the provided software, and would be interested in writing their own. 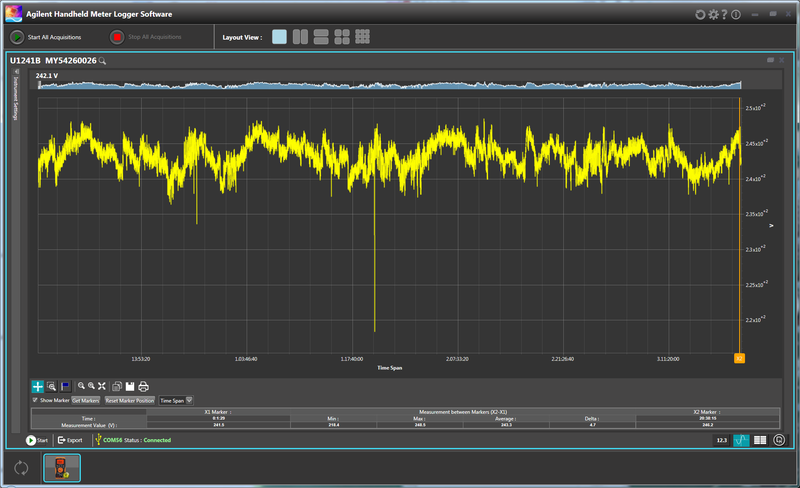 The good thing is that the protocol is a rather simple “SCPI-style” command set transferred over serial at 9600bps. The full details seem to have been nutted out by the guys at Sigrok. By issuing the *IDN?<cr><lf> command, you can “seize” remote control of the meter (lights up the “remote” indicator on the LCD). Agilent/Keysight’s U1241B offers a competitive portfolio of features and options for the price. With a class-leading accuracy, and a sturdy 4-digits of display, it satisfies with a decently robust build quality and proper safety qualification credentials. 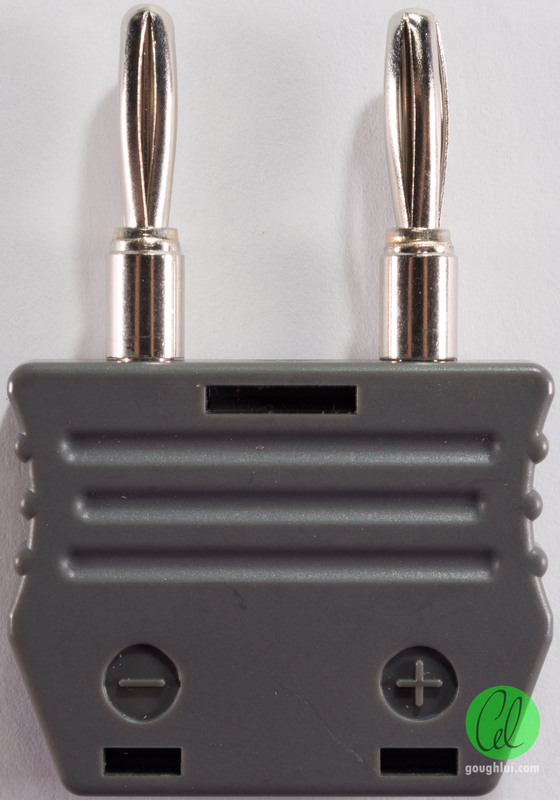 The ability of the meter to connect remotely to PCs and tablets/mobile phones through optional cables and adapters leads to a new range of possibilities which improve convenience, safety and breadth of possibilities available with the meter. While the software on the PC is generally well designed, some data loss incidents were still experienced. 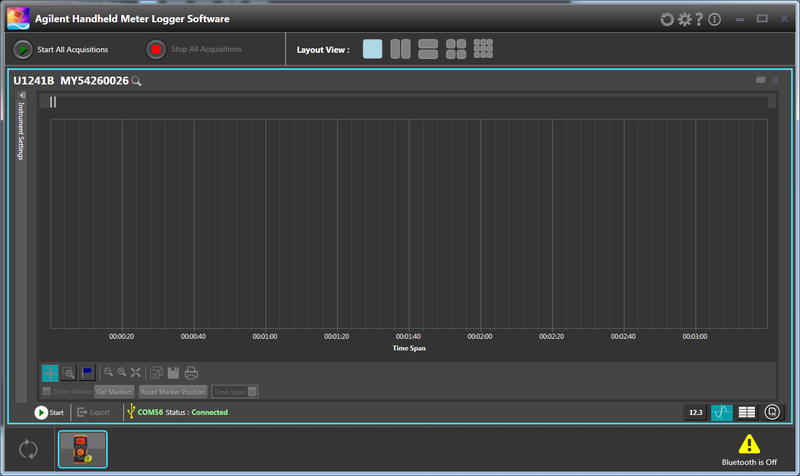 The software on the mobile platforms still require some more polish, however. That being said, given the ‘free’ nature of the software, one can hardly complain given the trivial ease of interfacing with the meter itself through SCPI-like commands over serial. This entry was posted in Electronics and tagged electronics, element14, new stuff, newstuff, review, teardown, test equipment. Bookmark the permalink.